Since June was Nickname Month on Page 2, we've taken the best monikers from our monthlong search for the best nicknames in all of sports and present them here to determine the best of the best. 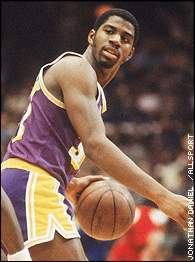 It's almost as if "Magic" was Earvin Johnson's given name. Below are Page 2 editors' and readers' top choices from each category we've compiled in the past month: basketball, baseball, football, hockey, boxing, sports unit and sports moment. After considering all 20, vote in the poll at left for the best sports nickname of all-time. Terry Bradshaw's desperation pass deflected off Raiders safety Jack Tatum and then hit Steelers receiver Frenchy Fuqua before Franco Harris grabbed it and headed for the winning touchdown as time expired in Pittsburgh's 1972 AFC divisional playoff victory. Perfect nickname for a Hall of Fame receiver whose left leg never knew what his right leg might do, and vice versa. Minnesota Vikings' defensive line of the 1970s. Pays respects to his hometown in Quebec and shows how calm and cool he was in the net. Small, fearless (at least, until the Leornard fight), he hit like a ton of bricks. University of Houston men's basketball teams of 1982-'83 and '83-'84. 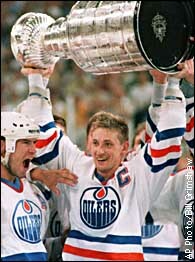 "The Great One" won four Stanley Cups while playing in Edmonton. One of the few who outplayed his own great nickname. No team or unit name ever reflected the city it played in like "The Steel Curtain." The name represented hard-driving players and spoke volumes for the city of Pittsburgh. 12. "The Thrilla in Manila"
This Ali-Frazier classic gets a slight nod over another favorite nickname for a boxing match, "The Rumble in the Jungle." It's probably the most colorful nickname in sports history, with a great story to back it up. The rarest of combinations: great player, wonderful man. 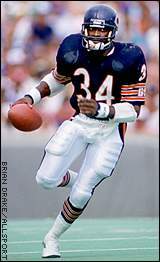 "Sweetness" described Walter Payton on and off the field. Don't ever come in here with that weak stuff again! 16. "The Miracle on Ice"
Al Michaels' call said it all: "Do you believe in miracles? Yes!" Back in the day, "The Kid" was as skinny as a snake, and just as dangerous. Just absolutely hilarious and the only thing that was memorable about the XFL. The nickname "Iron" was as simplistic as his style; he didn't need a ring entrance with the production value of a Hollywood blockbuster, just black trunks, black shoes, and intimidation. It's almost getting to the point where you don't even call him "Curtis Joseph" anymore.